The Flexible payment method will allow you to provide your attendees/registrants with specific instructions (e.g., offline payment information) for how to pay for their registration. Need to Buy a Support License for the Flexible Payment Method for Event Espresso 4? 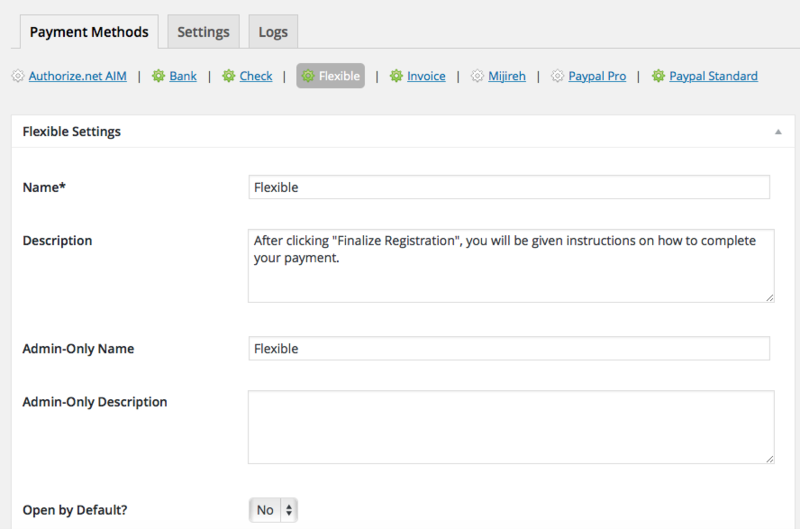 This payment method is a plugin for WordPress and can be installed through your WP dashboard (WP-admin). Download the latest version of the Flexible payment method for Event Espresso 4 from your Event Espresso account. Login to your WP-admin (WP Dashboard) and go to Event Espresso –> General Settings –> Payment Methods. Once on the Payment Methods screen, click on Flexible and click on the button to activate the payment method. Update the instructions area to provide information on how you want your registrants/attendees to pay and then save changes by clicking on the Update button. The Flexible payment method will provide your registrants/attendees with information on how to pay for their event registration. This payment method does not move or transfer any funds. Instead, you are providing information on the steps that an attendee needs to complete to pay you. + Thanks for starting registration. Call us at 800-123-1234 to complete your payment for your registration. We accept all major credit cards. + You can pay the day of the event. Be sure to arrive early. We accept VISA, MasterCard, Discover, American Express through the Square app. + You can pay the day of the event. Be sure to arrive early. We accept VISA, MasterCard, Discover, American Express through the PayPal here app. You can even pay through PayPal using the app. This payment method defaults to the similar messaging as shown above. Be sure to update the messaging via the instructions field for this payment method in through your WordPress dashboard. I configured the payment method, and payments are not being processed. Can you help? This payment method does not process or transfer actual funds (monies). You’ll need to provide instructions on how an attendee/registrant can pay (e.g., pay the day of the event or call a phone number to pay with a bank card). This can be done by using the Instructions field on the Flexible payment method settings. 2) Then process a refund through the payment option that was used. For example, if an attendee/registrant paid via money order, then you would need to refund their payment through a new check or new money order. Our support team cannot write custom coding for you. Below are some examples on customizing this payment method.